Follow this step by step guide to learn how to import powerpoint slides in prezi. Learn how to work in prezi, present the powerpoint slides in a layout, etc. Don’t forget to check out our site http://howtech.tv/ for more free how-to videos! 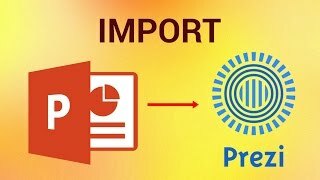 In this tutorial, we will teach you how to import powerpoint presentation to prezi. We will add teach you how to import powerpoint presentation slides into prezi, present them in a layout and eventually present them in a slideshow. Follow this step by step guide to learn how to import powerpoint presentation to prezi. First of all, open your browser and go to prezi.com. For the purpose of this tutorial, we have already created an account on prezi. Once you are logged in with your account, click on the new prezi button available on the left hand side. A new page will open up in a new tab where you will be asked to choose your template. For the purpose of this tutorial, we will start off with a blank prezi. You will notice a circle where you can add a title. Since we want to add a powerpoint presentation, we will simply delete this and make the prezi blank. Once you are done, go to the top and click on the insert button. From the drop down menu, select the PowerPoint option. As a result, a window will appear from where you can open the presentation that you want to import here. Once you have opened the ppt, you can monitor the progress of the upload in the right pane. Once the powerpoint slides have been downloaded, click on the insert all button to add all the powerpoint slides to prezi. As soon as you click on the insert all button, you will be asked to choose a layout for the slides. For the purpose of this tutorial, we will choose the caterpillar layout. You can add a path between your slides by checking the respective option. Click on the insert button to insert the slides in the particular layout onto prezi. Click on the green tick mark if you are satisfied with the insertion. You can always zoom in and out of the different circles, increase or decrease the text box size, tilt the text boxes as per your requirement, etc. Once you are done with the changes, click on the present button on the top left corner of the page. As a result, a prezi slideshow will start in full screen. Click on the arrow keys at the bottom to skip from one graphic circle to another the same way you go from one slide to another. In this manner, you can import a powerpoint presentation to prezi. There is o instert all button.. Where I can get it? Is there a special app? Ok so I did a prezi on my friends account , any idea on how I can send it to my prezi account so I can work on it ? how to download this, this presentation once we did our work?